At the southern tip of Texas, SpaceX is preparing to begin testing their interplanetary spacecraft. The first Starship test vehicle, dubbed Starhopper, is in advanced stages of construction, and SpaceX facilities at Boca Chica and McGregor are preparing to support a flight test program beginning this year. 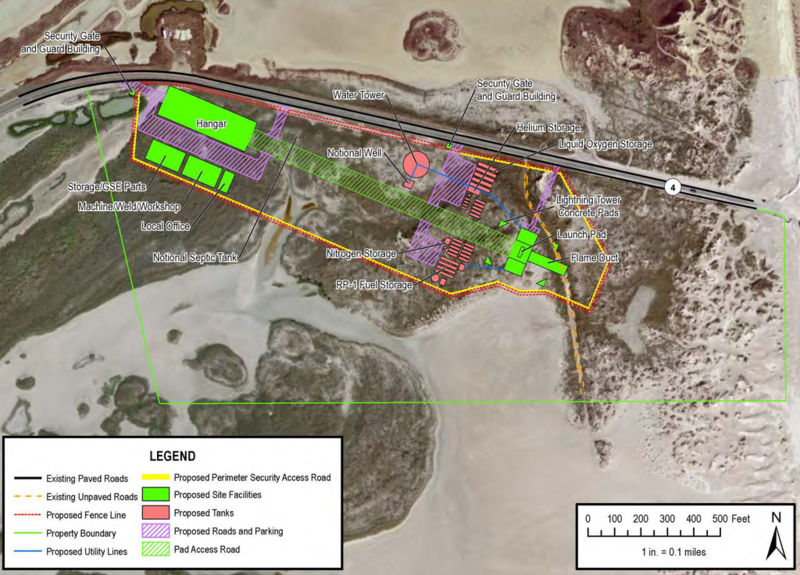 The new South Texas Launch Site was originally intended to be a third launch facility for SpaceX’s Falcon 9 and Falcon Heavy vehicles, in addition to Cape Canaveral, Florida and Vandenberg Air Force Base, California. While current plans now focus on the Starship and Super Heavy vehicles, the layout of the launch site appears to be largely unchanged. A building permit reading “operational hopper pad for rocket launches” is posted at the location of the originally proposed launch pad. 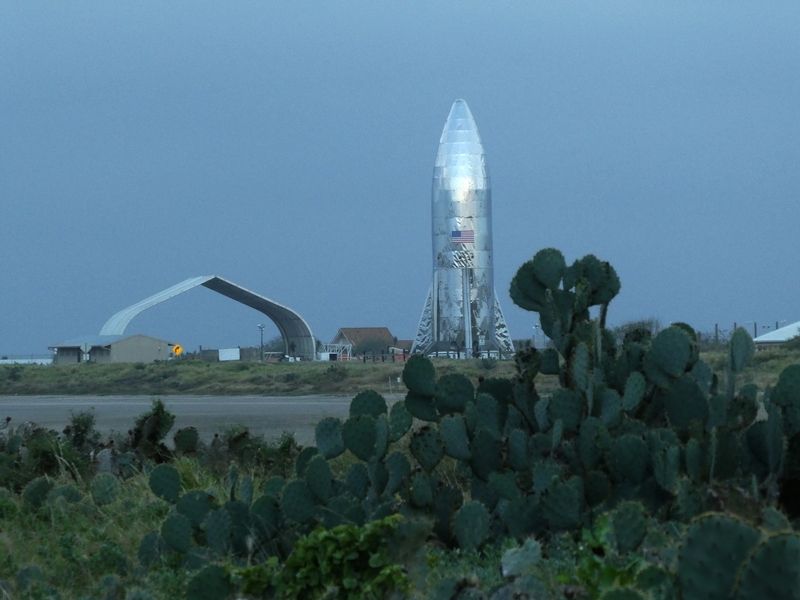 After years of minimal changes to the Boca Chica landscape, with SpaceX’s workforce focusing on the Falcon Heavy and Commercial Crew programs, a significant workforce has arrived to begin preparations for Starship. Construction crews have flattened a hill into a causeway, with a ramp at the east end for the pad site. Steel mesh and aggregate have now been laid on the ramp. Concrete trucks have most recently been seen at the pad site itself, as well as hardware for pad infrastructure including trusses, pipes, and electrical conduit. The pad will initially support atmospheric “hop” tests of the Starship test vehicle that is under construction nearby. SpaceX has suggested both Boca Chica and Cape Canaveral as launch sites for operational, orbital Starship missions that would utilize the Super Heavy booster. 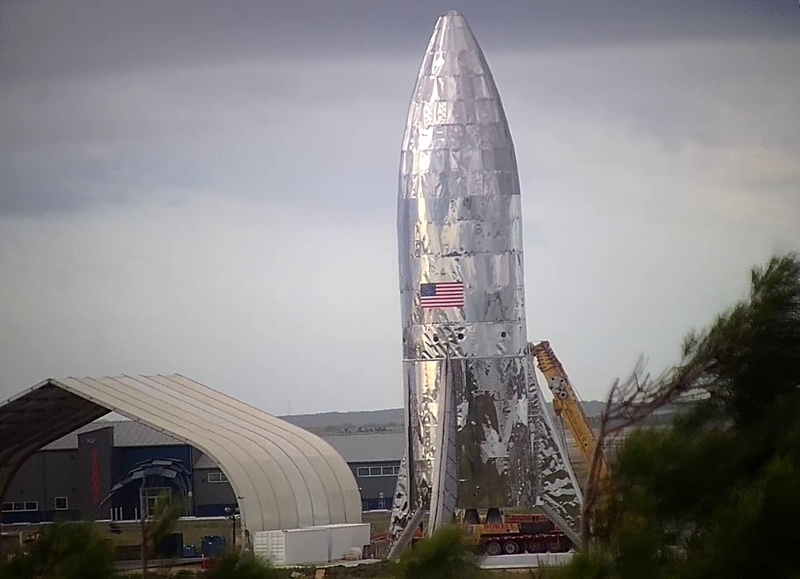 Construction of the Starhopper began in late November of 2018 when the first cylinder of stainless steel arrived outside a tent southwest of the pad site. Shortly afterward, a concrete base was poured to support the steel cylinder segments. It would later become apparent this was to provide clearance for the fins and engines. Through the beginning of December, more cylindrical sections arrived at the construction site to be mated. A crane was used to lift segments to the top of the vehicle before workers welded each cylinder together. In mid-December, workers cut holes near the bottom of the vehicle for the fins. The cylindrical structures that would make up the bottom of each fin were added days later. During the rest of December, the tops of each fin were attached to the fuselage, which was then removed from the concrete base and is now standing on its own. Moving the vehicle revealed that three engines had been installed in an in-line configuration. SpaceX CEO Elon Musk stated on Twitter that these engines are a “blend of Raptor development & operational parts.” It is unclear whether these engines will be used for initial test flights or if they are only placeholders for fit checks. Also appearing at the construction site was the nose section, which was wrapped in a reflective foil not seen on the lower sections. The cylindrical section that would eventually prove to be the middle of the vehicle, between the lower fin section and the nose section, was on top of the concrete base with a similar foil covering. The foil material is believed to be stainless steel sheet. The lower section of the vehicle, uncovered, has been polished. 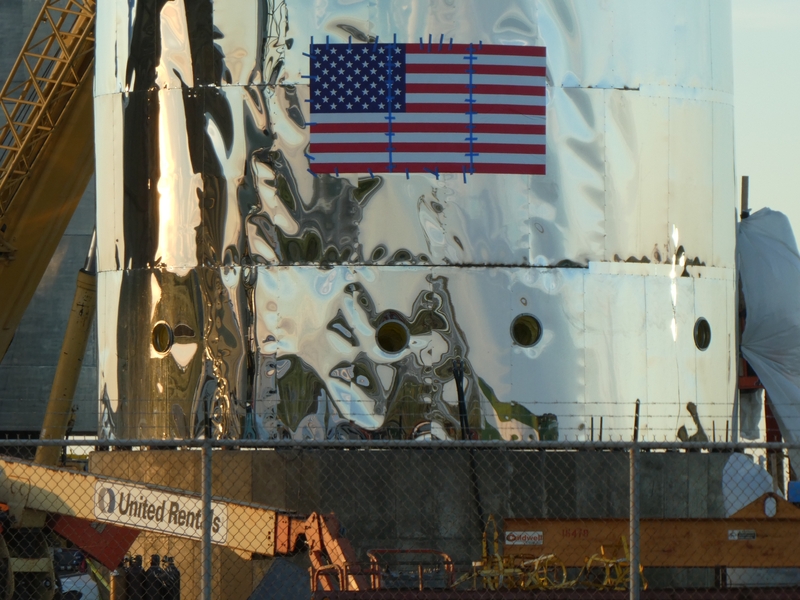 At the beginning of January, stainless steel sheets were installed over the lower section of the Starhopper vehicle, including the cylindrical framework of the fins as well as the cylindrical fuselage. Multiple small holes, whose purpose is unclear, were cut in the middle cylindrical section sitting on the concrete base. Additional oversize hardware also arrived on escorted flatbed trucks. 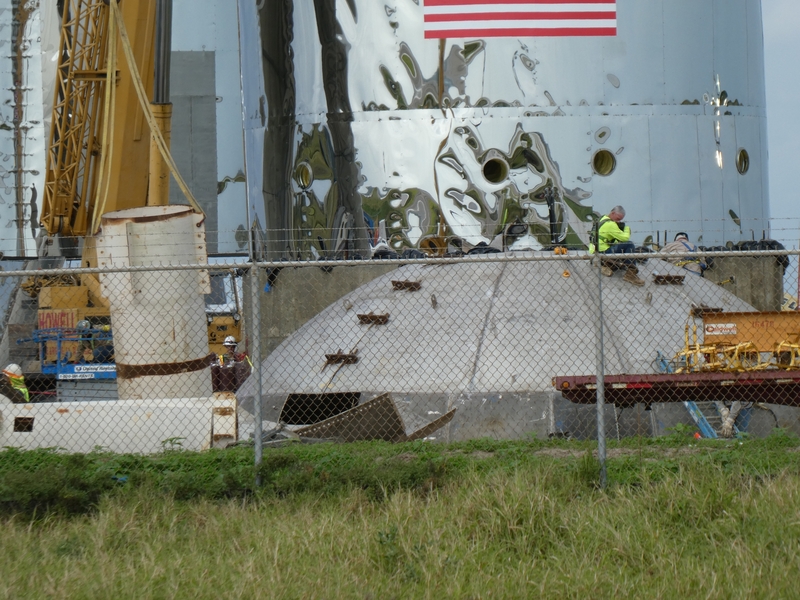 Most recently, a dome structure appeared next to the test vehicle, which Musk later confirmed to be a fuel tank bulkhead. 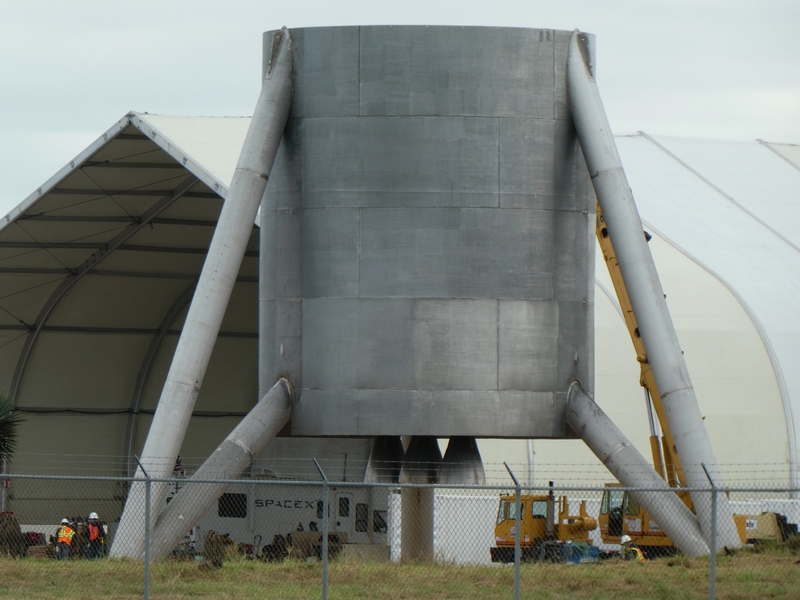 No fuel tanks have been spotted being installed inside Starhopper to date, suggesting the vehicle may need to be disassembled to prepare for test flights. The upper section of the vehicle was briefly lifted above the lower section for an apparent fit check, before being lowered back to the concrete base the same day. The vehicle has since been stacked again. The bulkhead spotted nearby was still outside, not installed in the hopper, during both lifts. 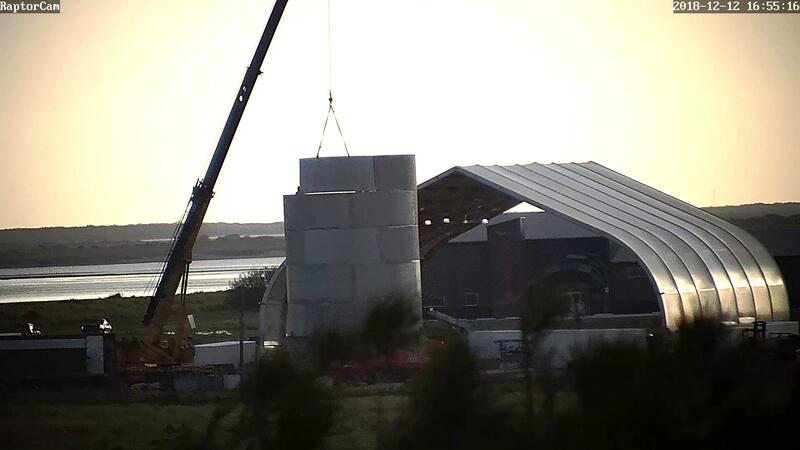 The rapid progress at Boca Chica is indicative of a shifting focus for SpaceX as Falcon Heavy becomes operational and Commercial Crew nears the first test flights. A similar timeline was set for testing of a redesigned Raptor engine that will power Starhopper. Musk stated on Twitter that the first engine is almost finished assembly at SpaceX’s Hawthorne, California factory, and will probably be ready to fire in February. It remains unclear if the first Starhopper flights will use the engines currently installed on the vehicle or the redesigned engines being prepared to fire. 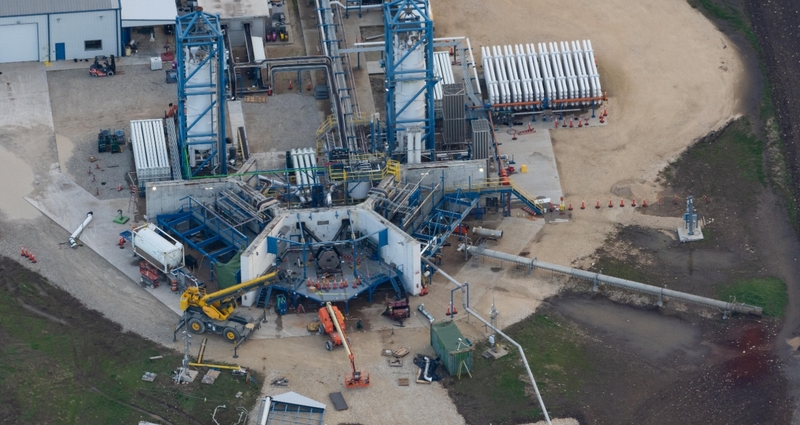 Like previous Raptor tests, the redesigned engine will likely be fired at SpaceX’s Rocket Development Facility in McGregor, Texas, where the Raptor test stand has been recently upgraded. The modifications include extending the elevated work surface below the engine mount, and a reinforced thrust structure. The reinforcements are likely connected to the redesign of the Raptor engine. The Raptor redesign came in parallel to the change from carbon composites to stainless steel for Starship construction. One possible reason for the change is the more durable nature of steel, which would be crucial for spacecraft designed to be reusable for many missions, such as Starship. FCC filings for radio communications between ground controllers and Starhopper describe two tiers of initial tests: low altitude flights to a maximum altitude of 500 meters, and high altitude flights to a maximum altitude of 5 kilometers. 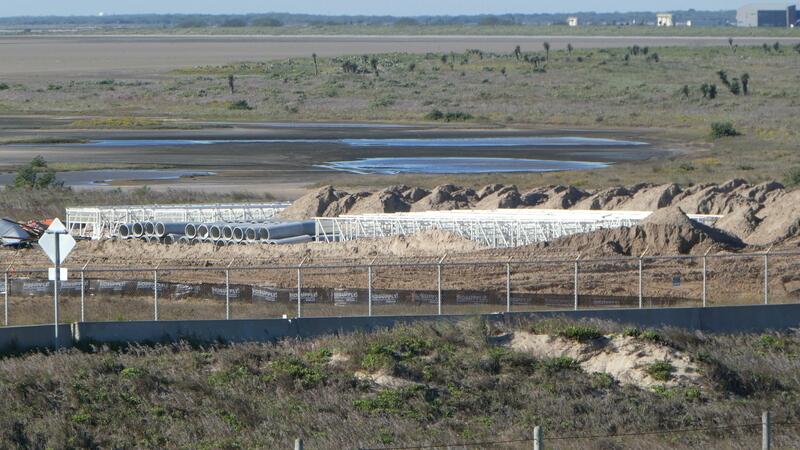 Boca Chica is also the site of SpaceX’s Texas tracking station. 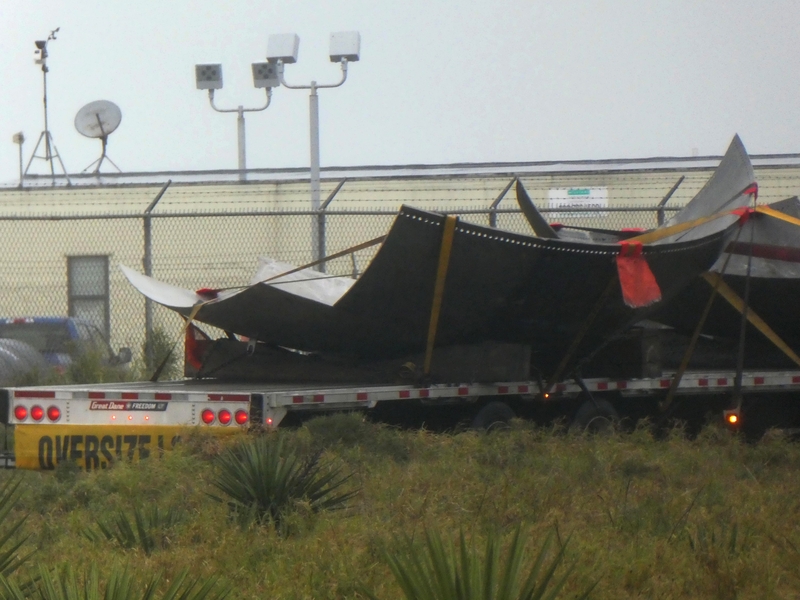 One of the pair of tracking dishes at the site, brought in from Cape Canaveral in 2016, has recently been seen moving under its own power. They are expected to be ready to track Crew Dragon during the uncrewed DM-1 test flight this year and will be used for all future Crew Dragon missions.